It's not until I start dyeing yarn again that I remember how much I love it. 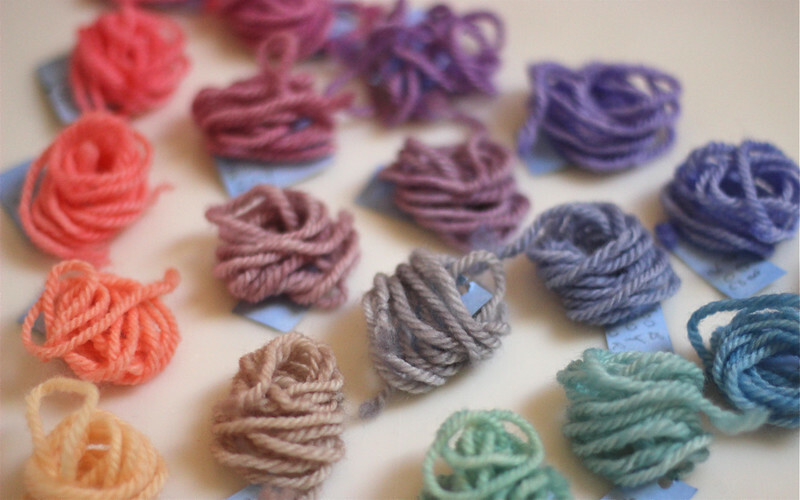 Dyeing yarn is both thrilling and relaxing all at once. It's a wonderful feeling to be lost in time, watching magic happen right in front of your eyes. Getting everything ready takes a while, I spend ages tying my skeins a bunch of times so they don't get tangled, soak my wool (or not, depending on what I'm doing), warm the water, plan colours and mix dye. 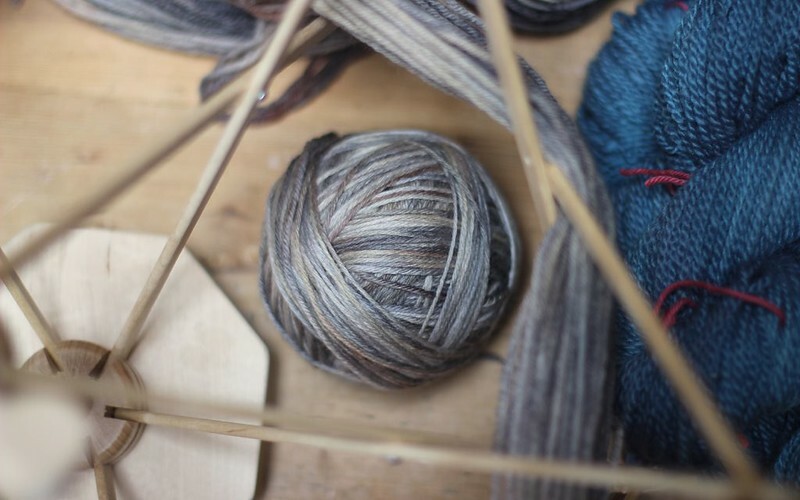 Finally, when you're ready, things start to happen quickly and the real fun starts as yarn is dipped in colour and the colour starts to ooze into the wool. I still think of myself as a novice dyer. An "experimental" dyer. I wonder if that feeling ever goes away. No matter how much I plan to make a particular colour, I'm never sure how it's going to turn out. Fortunately so far, my experiments have all had happy endings. Mind you, dyeing might be a bit like having babies - you're totally smitten with your wee bundle no matter what! This week I've managed to dye two lots of wool for sweaters for me. They're both aran weight and there was rather a lot of wool to squeeze into my dye pot. 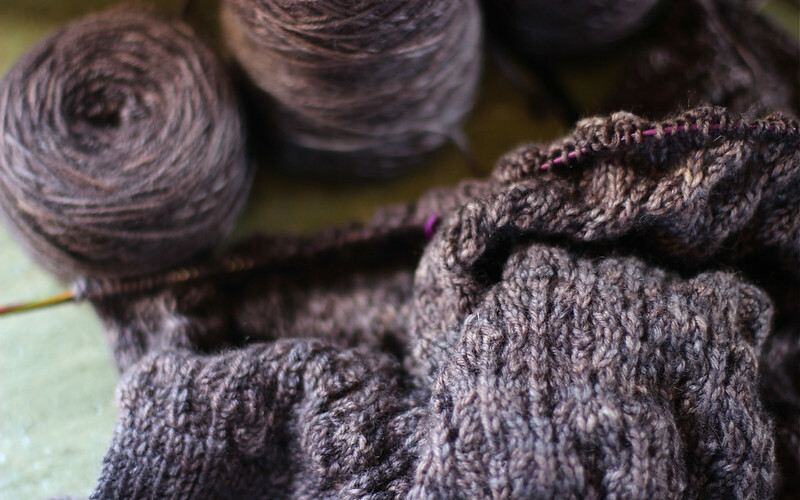 I'm going to knit Alicia Plummer's In Stillness sweater with the tawny-grey colourway. 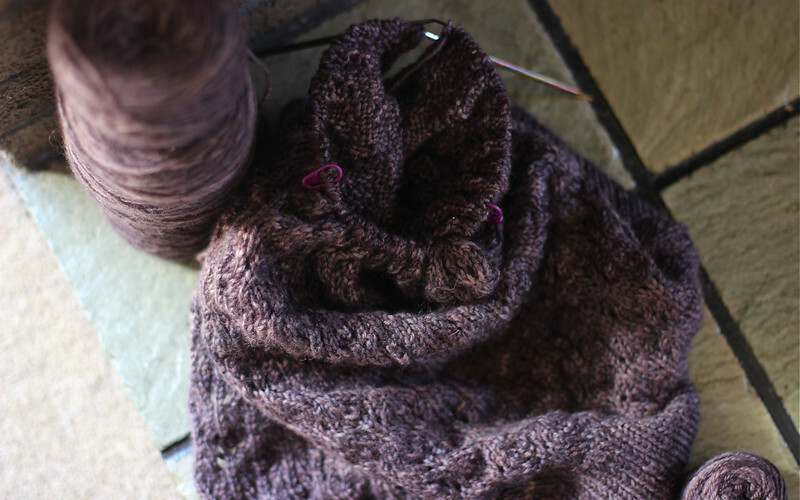 It's a reasonably simple garment and I think it'll be able to tolerate a small degree of variegated yarn. 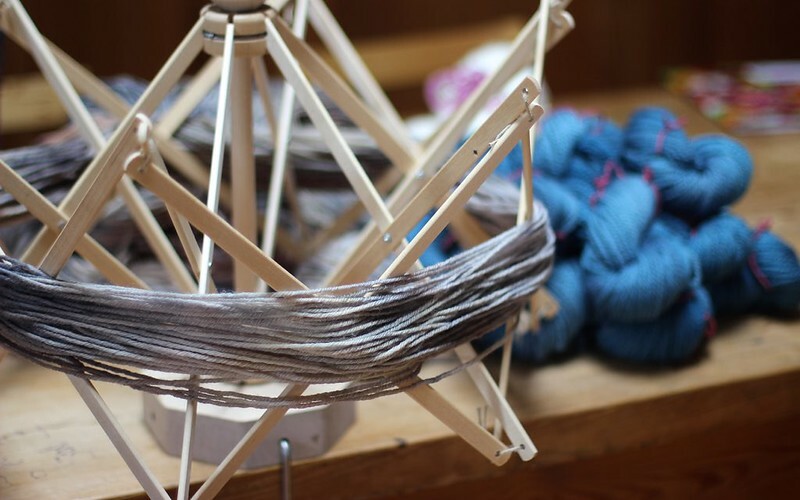 I was shooting for a beige-lilac but as I started to get colour onto the yarn I decided I wanted grey undertones rather than yellow, so took a slightly different direction and added a grey wash to get an ashy, neutral look. The second batch I dyed had me scared silly. The yarn is absolutely gorgeous, fresh from the sheep, Black Hills aran yarn. It's springy and rustic and I was so nervous to add colour to it. Plus, I felt a bit guilty. It was such a great cream colour. But, I can't wear a cream sweater with (or even without) small children around so I resolved to do my best and decided to keep it simple. Just two tones of blue - a teal and an inky blue. I'm casting on Shannon Cook's Antrorse sweater and with the textured detail down the front and around the yoke I decided I needed a gently tonal yarn. Won't this blue be lovely? It's rich and warm. I'm picturing it with my dark indigo jeans and my long brown boots - finished off with a beautiful shawl thrown around my neck and a cute hat pulled down over my ears. Ooh I can't wait! I've got one more batch to go. 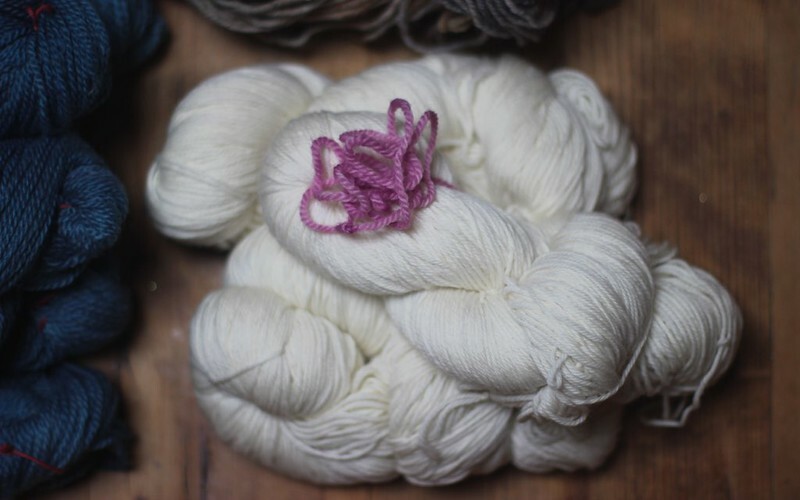 I've bought some undyed Polwarth yarn for my dautghter and it is deliciously soft. She's requested "purply-pink" and chose this pinky sample for me to aim for. Oh my goodness. The Outfit is going awry. Check it out. I tried to get the colours as accurate as I could but everything still looks a little greyer than it does in real life. Think pitch black. BLACK. 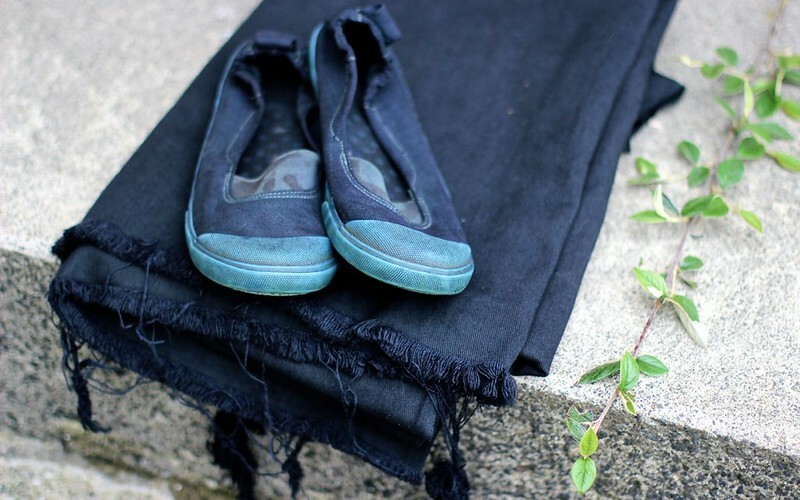 I actually dyed both the fabric and the shoes twice. The first time I bought a small packet of black dye for the washing machine and a bag of salt and chucked it all in. Around and around they span and looking through the door (front loader) I was hopeful. But when they came out and then dried, my hopes were dashed. The shoes were ok-ish but a bit motley but the fabric was a solid olive green. Far from the grey I was after. Bother. It took another week to get more dye and then a bit longer to get them back in the machine. I hunted for grey dye but couldn't find any and settled for more black. To be on the safe side I bought a bigger packet and I tentatively thought I could just keep adding more until it all turned out perfectly. The story goes downhill at this point. One day, whilst trying to do a million and one other things at the same time (most likely cook dinner, supervise homework, sweep the kitchen floor and talk on the phone) I was struck with the thought that I'd do a quick dye job while the washing machine was free ... Dumb idea because in the chaos I decided to chuck the whole large packet of dye in to save mucking about with copious dye jobs. You can imagine what happened. In fact, you can see what happened. The whole belly lot went blacker than black except for the stitching on the shoes which is still too light, the rubber soles which are a decidedly dodgy shades of blue and the elastic which looks worse with the stains even more noticeable. The shoes are a disaster! I'm trying to talk myself into the fabric. After all, everyone wears black in New Zealand, I wouldn't be out of place? Except I haven't worn black for years. I embrace colour and frills and sequins these days. I'm not sure whether I want a black skirt. Maybe with some top-stitching? Dunno. That might just look odd. I think I'll have to take the plunge and see how it goes. I don't think I can do anything to lighten my black fabric and I really don't want to buy more. This is it. I'll have to make it work! Make me feel better. Tell me about your dyeing disasters! Oh My Goodness This Is So Much Fun! I had a little "dye-up" over the weekend. Hit by a sudden urge to make some colour I grabbed my remaining undyed yarn or in one case, blah, pale coloured yarn and heated up my pots. Still fairly haphazard in my approach, arriving at these colourways took a fair bit of playing around. In fact, I really didn't have a plan at all when I started and I wrote absolutely nothing down (it never actually crossed my mind) so these are truly one-off's never to be repeated. I'm feeling quite split about me, precision and dyeing. 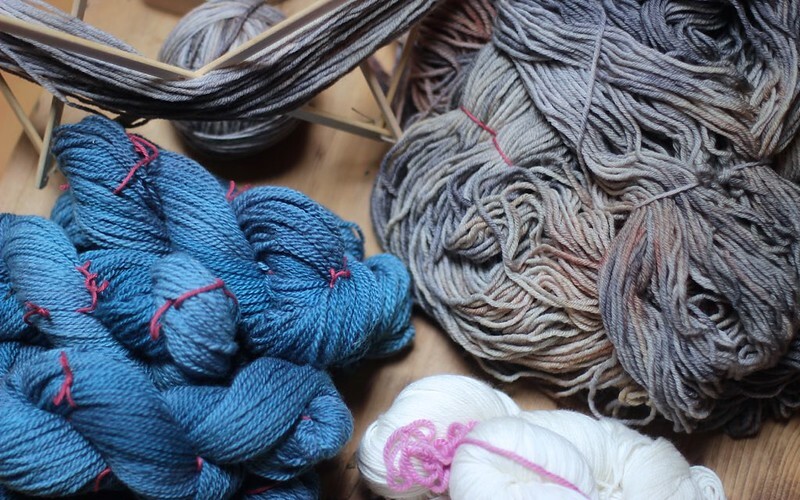 I absolutely loved my very technical colour experiments and it's useful to be able to eye them up and remind myself what proportions make certain colours but, a big part of what I love about dyeing is the unexpected and the freedom to just "make". It might be nice to be able to repeat colourways again if I fall in love with them but then again, I kind of like that I can't. It makes me happy that each one is unique and I love the idea of approaching my dye pots with a completely clean slate each time. These skeins were first out of the pot. Starting life as a fairly bland light brown onion colour they took a fair bit of messing about to end up these rather delicious rich rhurbarb shades of red and olive. In the process they taught me several things. 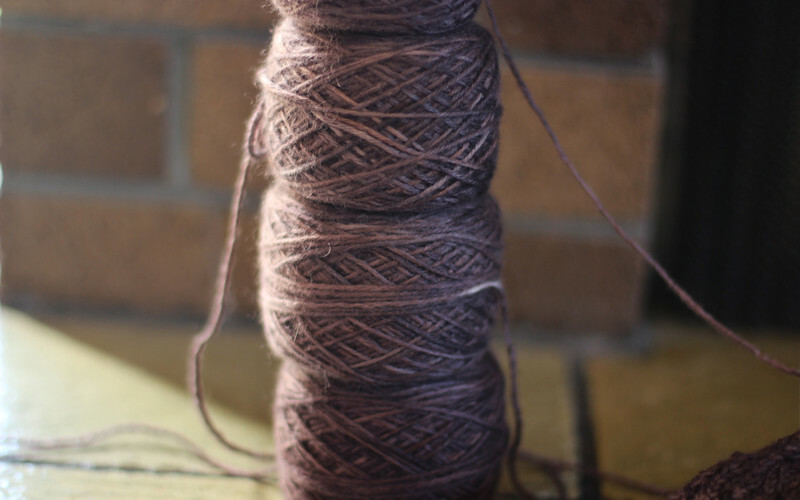 Firstly, if you add colours willy-nilly you'll eventually arrive at rust coloured yarn. 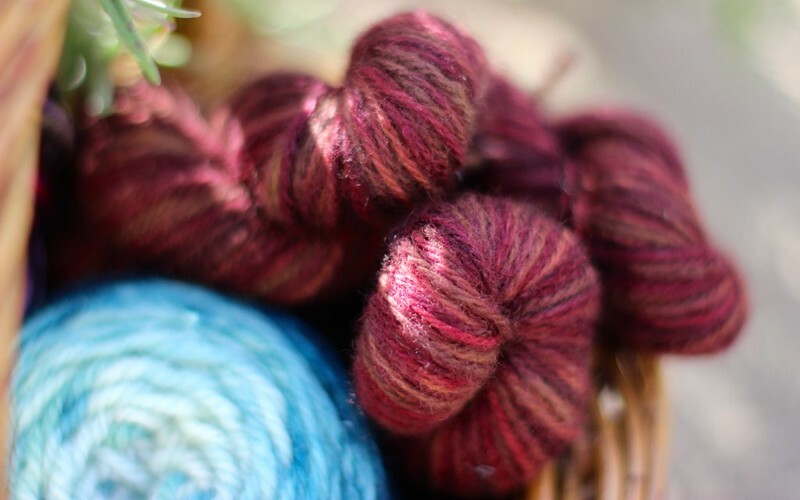 Secondly, you can indeed start to felt yarn when you're dyeing if you fiddle and squeeze it too much. This DK (organic) yarn is a bit stuffed cos it got a bit felted but I think it might be destined to be a little vest so hopefully it'll not matter. Faced with a pot of teal dye and not wanting to waste it I was struck with the idea of throwing a whole cake of yarn in just as it was. 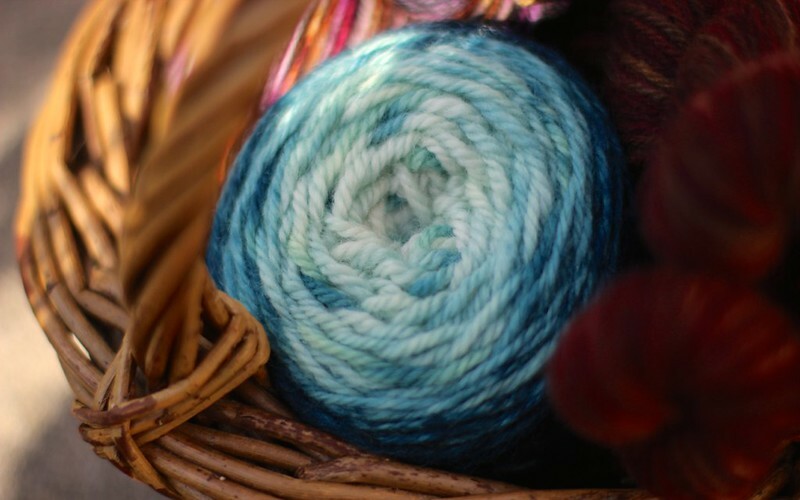 It so happened that a fat cake of chunky yarn was sitting by my side when I had that very thought, so in it went. Of course it wanted to float so I held it under the water with a heavy jar. After what seemed like forever (but was probably more like half an hour) I lifted it out. Sure enough, I'd achieved a gradient-like effect with the yarn slowly fading to white at the centre. It's a bit blotchy all the way through so its not as smooth a gradient as it could be but it's pretty fun. Dyeing does seem to flow better the longer you spend doing it. At least, that's how it is for me. This last skein dyed as if by magic. It's about 50g of soft merino 4ply left over from knitting a baby cardigan at least 7 years ago, maybe 10. You can see the different effect dye has on superwash wool as opposed to the non-superwash wool in my first picture. The colours are much more vibrant and electric. This aspect of superwash wool has me in a bit of a pickle. 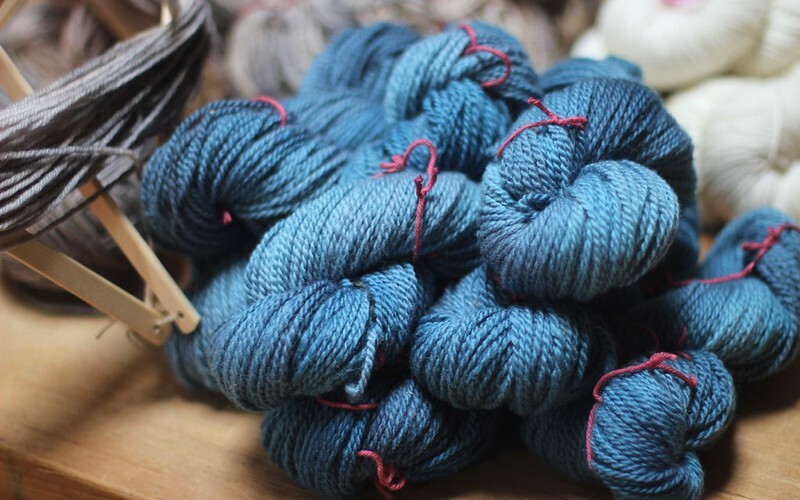 I'd rather use non-superwash wool because it is less processed but I think doing so means I'd end up with more muted colourways. Lovely but not necessarily what I'm always after. I'm wondering whether a silk blend would offer some glossiness? Clearly I'll have to experiment and see. As to this colourway, at one point I found myself rubbing portions of it inside the empty yellow dye jar to get brilliant glimmers of gold. See, techniques like that don't really lend themselves to being repeatable! Making art has always been a huge part of my life but at school I always had timetabling issues trying to balance art classes with maths lessons. I loved both and although I did toy with the idea of becoming an architect like many of my relatives, little did I know that decades later, knitting would turn out to be my perfect combination of art and maths. It's funny how things work out. Of course, I'm talking about "knitting" in the broadest sense of the word. Maybe I should say "fibre arts"? It's no secret I am an obsessive knitter but I also get quite a thrill making up my own patterns and I've been well and truly seduced by spinning. 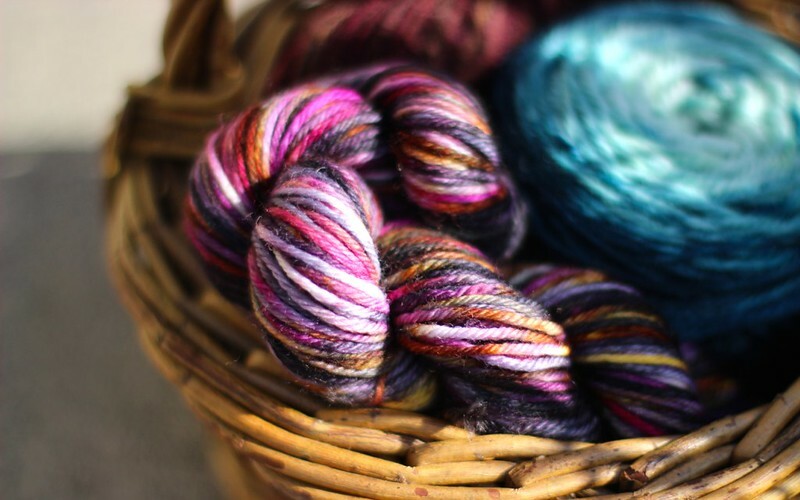 Well, my latest adventure has been playing with colour and wool and oh boy - dyeing is SO MUCH FUN! My first attempts were quite random as I splashed, poured and dipped. I've shown you some of them; my pretty pink socks and my earthy cardigan (both waiting patiently to be finished). While I was quite happy with how they turned out, I decided that I needed to get a better handle on how much dye it really took to make different strengths of colour and I wanted to experiment with the three primary colours (red, yellow and blue) to see exactly how they'd combine to make different colours. I am not a cook whose strength is measuring accurately but for the purposes of learning a bit more about dyeing, I told myself to knuckle down and have a go. 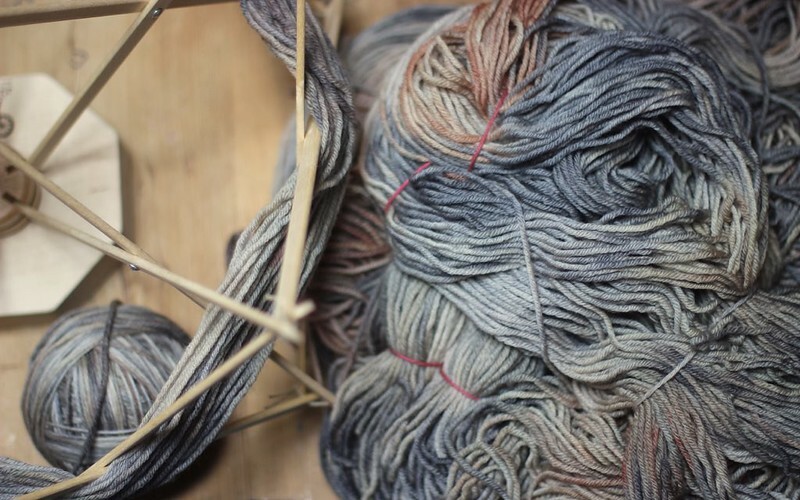 A couple of years ago I heard Annette talk about dye triangles on her podcast Gentle Ribbing. It looked fantastic. 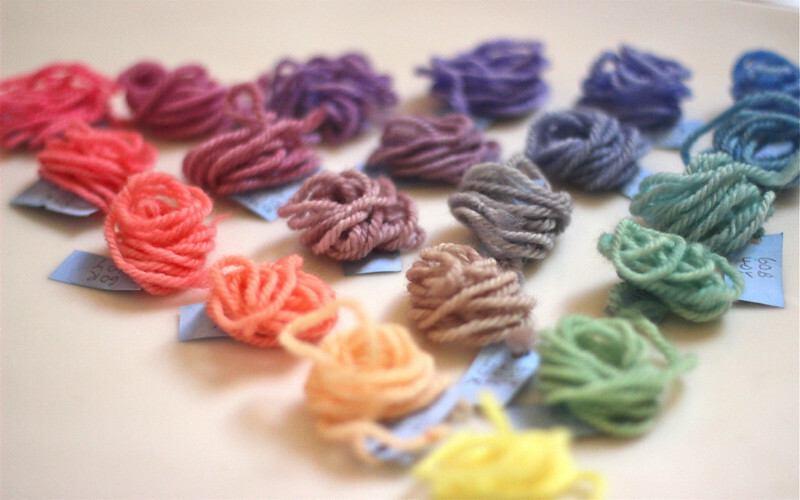 She'd done tons of experimenting and made lots of little samples of coloured wool so I started there with her ideas. Working out the maths was pretty intense but I did it in the end! Basically, what I've got is dye-stock at 20% of full strength, diluted a bunch of times to dye just a tiny bit of wool much the same colour as I would have dyed a 100g skein of wool. The only dyes I used were yellow, blue and hot pink Ashford acid dyes. Apparently hot pink is the closest to pure red in the Ashford range. The colours at the corners are the 100% yellow, blue and red samples. Along the edges of the triangle the colours are combinations of two of these three colours in 20% increments. So, the apricot colour closest to the yellow is 80% yellow and 20% red and the more orange sample next to that is 60% yellow and 40% red. And so on - red to blue, blue to yellow. Isn't is fascinating how the shades change? I marvelled at the proportions required to make some of those lovely blue/green shades. It was the mucky shades in the middle that really got me. Oh my, aren't they gorgeous?! Slightly more complicated to create, they use different proportions of all three primary colours. The samples that sit neatly in the corners near the red, yellow and blue are all 60%, 20%, 20% combinations, with the 60% being the primary colour it is closest too. 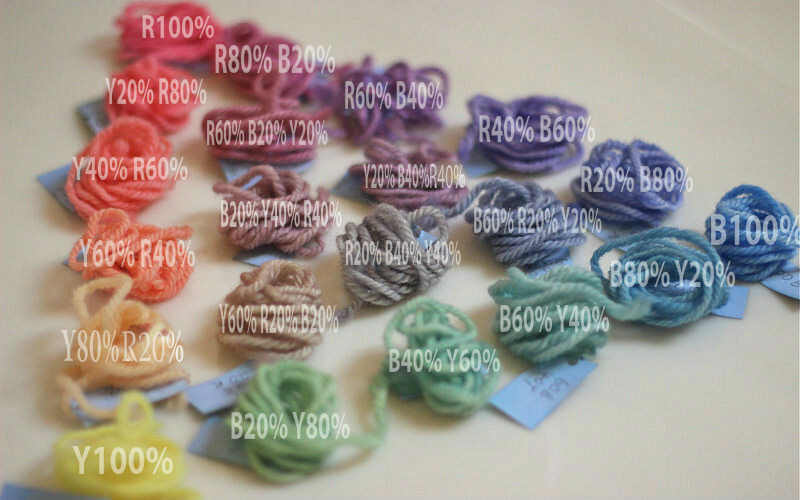 The other three are 40%, 40%, 20% combinations, with the 20% being the primary colour it is furthest from. So the silvery grey shade in the centre of the picture above is only 20% red. You're probably totally confused by now? Here you go - I've given you an idea of what's what on the picture below. Of course, this is only a rough guide to colour mixing and if you were really keen you could break down the increments to much smaller amounts to discover the colours in between these ones. But, it's a good start for me. Funnily enough, I learnt a lot more than just how red changes to blue or blue to yellow by doing this exercise. I did learn about diluting dye and how only a tiny amount creates colour beautifully. I was impressed by the delicious mucky colours I could create with just red, yellow and blue. But mostly, I learnt something that I already knew so well. That is, I'm really not a paint-by-numbers sort of artist, especially when it comes to making colours. I am a haphazard, see-what-happens sort of artist, liberated when I go with what "feels good". I had planned to repeat this exercise with 75% strength dye but I'm not going to. I'm going to play and have fun and see what other lovely colours I can come up with, without too much accurate measuring. 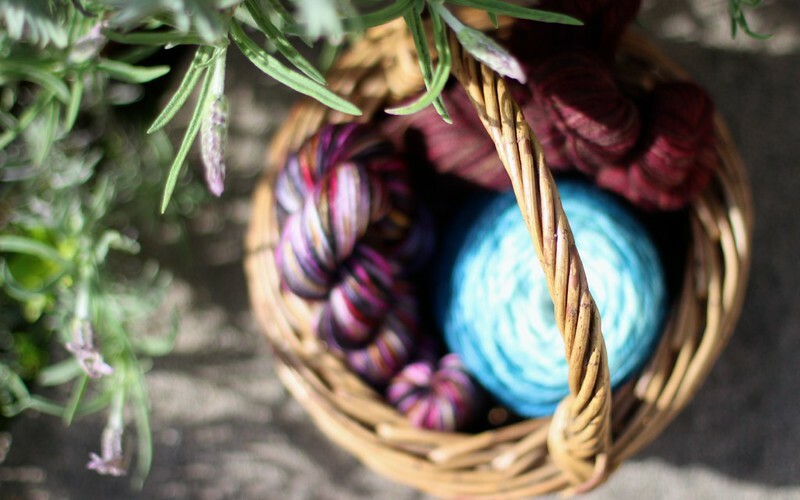 Have you played with dyeing yarn or fibre? I'd love to know what you've learnt. It seems that lots and lots of you still love reading blogs (yay!) and for the majority, Facebook isn't such a biggie. So, I've decided that for now, I'm going to stick with the status quo. I'll post links to my blog posts on Facebook, but not inundate your feeds with my chatter. Later on, if you'd like to see/hear more from Truly Myrtle on Facebook, let me know. In the meantime, if you do want peeks into my daily comings and goings, including cooking, gardening and general life stuff - you can find me on Instagram. I'm there nearly every day. I was all set to tell you about my rather delicious stripy socks today. I'm trying new yarn from down here in New Zealand, learning a bunch of new stuff about knitting socks and trying new techiques. But, I'll tell you about all of that interesting stuff later in the week. Right now I've got to tell you about something else that's on my needles, especially in light of the chilly weather we've had here over the weekend. It feels a little ridiculous to be complaining that it was cold because I think it was only about 17 degrees Celsius, hardly freezing! But it all must be relative because I felt soooo cold. Maybe it was after the long hot summer we've had, maybe because it's a damp sort of cold. Maybe (if you are reading this from the Northern Hemisphere, you might like to sit down before you read this next bit) it's because here in New Zealand we (mostly) have NO CENTRAL HEATING. My poor tender, gentrified bones just can't take it. I am no longer the weather-hardy Kiwi I once was. I am COLD. Fortunately, I cast on this cardigan a couple of weeks ago. I had a sneaking suspicion that I'd need some more cosy layers and had been keen to make Amy Christoffers snuggly Pomme de pin Cardigan for a long time now. The body is knitted from the bottom up in once piece and the sleeves are knit separately and then seamed into place. To finish it off you knit the button band up and around the neck. If you take a trip through the Ravelry project pages for Pomme de pin (of which there are many) you'll see some really fantastic cardigans made with Amy's pattern. I like to check out project pages for patterns because they give you a good idea of how the cardigan will actually knit up, without all the fabulous styling and photography that usually comes with the pattern photos. I'm enjoying this knit. The pattern is interesting whilst also satisfyingly simple and I seem to be getting through the body fairly quickly. I've just got up to the armpits and about to separate the fronts and backs. My Ravelry project page for this cardigan is here. The other thing that's making my cardigan knitting so totally lovely is the yarn. I adore the yarn and I'm pretty chuffed to tell you that I dyed it myself! I bought six skeins of soft creamy yarn from my lovely LYS in Cambridge, The Sheep Shop, ages and ages ago. It's a non-superwash DK weight British wool, 100% Bluefaced Leicester, spun at the mill of West Yorkshire Spinners Ltd in Yorkshire. The blurb on the label tells me that "the noble features of the tall Bluefaced Leicester sheep with its upright ears and prominent nose is a regular sight on farms across the UK. The wool is hightly valued, being creamy-white, silky and lustrous and providing some of the finest wool available in the UK today". I certainly agree it is silky and lustrous and would add it is wonderfully soft, so far is showing no signs of pilling and has a beautiful halo. I had every intention of dyeing this yarn when I bought it all that time ago but I've been too nervous to have a go. That changed a month or so ago, after some experimenting with the dye pots (which I'l show you soon) and one day I woke up feeling enthusiastic and went for it. I was after a semi-solid chocolate brown with grey/charcoal undertones and I think I've pretty much got it. The colourway (which remains nameless but should be called something like "Bravery and the Bear") has the depth and range of colour I was after. It'll go with everything. I think it was the final wash in a light grey bath that did it. Of course, I didn't write anything down. I excitedly swirled, mixed, dipped and twisted without a thought as to how I might make this colour again ... Please don't let me run out before I finish my cardigan! I calculated how much I'd need a bunch of times - it should be enough - but there's still that voice in my head that's watching the balls disappear and crossing her fingers it'll last till the end.